1,000,000 Sq. 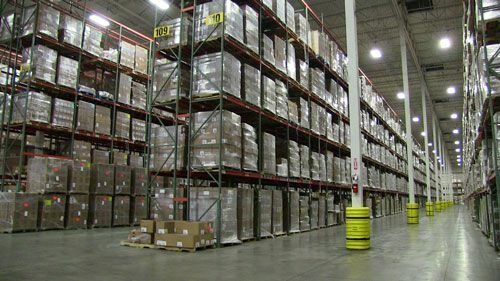 Ft of Warehousing & Distribution Space In The U.S.
As one of the North America's largest logistics and supply chain management providers, Averitt has the expertise and flexibility to help you reach your American, Canadian and Mexican markets with ease. Our 20+ Distribution & Fulfillment Centers are located in numerous major markets throughout the Southern and Central United States. Our facilities and professional staff can provide you a level of customized service that is unparalleled. From sorting and seg to pick and pack, labeling, kitting, packaging and assembly, Averitt will develop the perfect strategy for your needs. No matter what the size and type of inventory and freight you're moving, we can handle it. Our secure facilities can handle your spacing needs from a few thousand to tens of thousands of square feet. When your sales change seasonally, we can increase or reduce the amount of space your inventory takes up. We also manage dedicated distribution centers for customers that need the extra space. Backed by our 24/7/365 team of customer support specialists, we're always a call or email away. Our support center is located in the U.S. and is staffed by professionally-trained associates. We know that inventory visibility and shipping tracking is crucial to the success of any online business. Our facilities are outfitted with warehouse management system (WMS) technology and can also integrate with your inventory management software of choice, including Shopify. Our shipping and distribution options range from small parcel all the way to full truckload solutions. As a bonded LTL and truckload carrier, we can also provide full North America coverage to Mexico and Canada. From our facilities we can pack and ship your small packages via UPS, Fedex, USPS and others. We also offer white glove services, including room of choice, light assembly and debris removal.